The Tigris River is one of two main rivers of ancient Mesopotamia. This river forms the border between Syria and Turkey. Along with Euphrates River, it forms a great river system of south-western Asia. The Tigris River measures approximately 1,800 kilometers in length. It rises in the Taurus Mountains of eastern Turkey and then keeps flowing in a generally south-easterly direction and eventually joins the Euphrates River near Al Qurna in southern Iraq. This river has been an important transport route for so long in a largely desert country, Iraq. Tigris River is heavily dammed in both countries, Turkey and Iraq. The Mosul Dam is the largest in Iraq. The drainage basin of the river covers approximately 37,5000 square kilometers. It is the second largest river in Western Asia, next to the Euphrates River. It has 4 important tributaries which are the Adhem River, the Greater Zab, the Lesser Zab and the Diyala River. The land where this river flows through gets very little rainfall in a year so it has a hot climate. The course of the river has been altered over time so now the entire river system has different outlets. Approximately fifty different types of fishes can be found in the river. In ancient times, The Gharraf River was the main bed of the river but now is just a branch. The river is navigable to Baghdad for shallow-draft vessels. Declan, Tobin. " 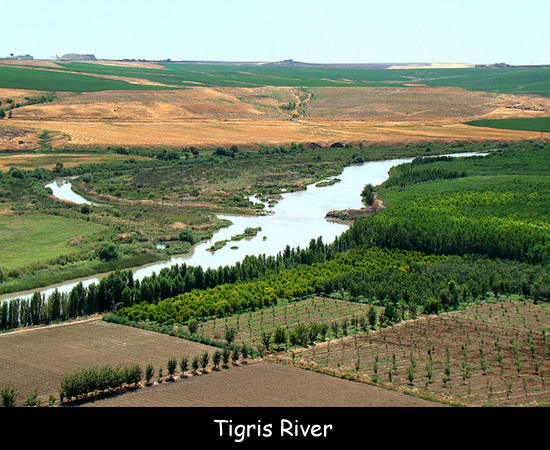 All Facts for Kids about Tigris River ." Easy Science for Kids, Apr 2019. Web. 26 Apr 2019. < https://easyscienceforkids.com/tigris-river/ >.